Compatible: Optiplex 755, OptiPlex 745,GX620 and GX520 Small Form Factor (SFF) Systems. UP for Sale Dell CPU Cooling Fan Assembly & Speaker Fan. Dell Part #:0G958P. Manufacturer: Sunon Fan. Model: MF80381V1-D000-M99,H814N Fan. Compatibility : It'syour responsibility to make sure that the item is compatible with your computer/laptop. It'sYOUR RESPONSIBILITY to make sure that you are ordering the correct item. This item is used in a good working condition. (Unless Sold AS IS). MPN: 9G0812P1F041. Model: OPTIPLEX 755. DELL OPTIPLEX 755. 1 Dell OPTIPLEX 755 Computer Cooling Case Fan. Form_Factor: SFF. Other_Infos: SAN ACE 80. 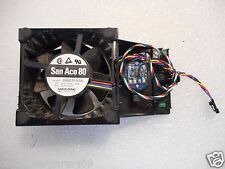 Type: Computer Cooling Case Fan. Most printers go to the refurbishing process after the order is made. 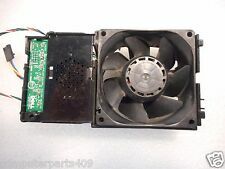 Ready for use Case Fan for Dell Optiplex 755 Computer. Laptop NOT included. Dell Optiplex 755 GX620 GX520 SFF Cooling Fan & Shroud AVC DA08038B12H 0KG316. MPN: HU540, M8788, KG316, P8402, P8482, M8041, G958P, M556N, YN033, YW713. Compatible: Optiplex 755, GX620, and GX520 Small Form Factor. Most printers go to the refurbishing process after the order is made. Manufacturer Part Number: YW713. Part taken from a good, working Dell Desktop. Dell OEM Original Part. Tested and Verified working. Item Condition. Grade A: Like New with very few scratches or wear marks. Manufacturer Part Number: PD812. Part taken from a good, working Dell Desktop. Dell OEM Original Part. Tested and Verified working. Item Condition. Grade A: Like New with very few scratches or wear marks. Size: 80X80X38MM. 1pcs Cooling Fan. Connector: DuPont 4 pin plug (support for speed! Bearing: double ball. ). Part Number - FK458. DELL OPTIPLEX 755 HARD DRIVE CADDY w/FAN. Manufacturer Part Number: HU540. Part taken from a good, working Dell Desktop. Dell OEM Original Part. Tested and Verified working. These pictures show what will be included with the part portrayed. Item Condition. MPN: 0G958P. Our support team is highly dedicated to handle all your needs. Warranty Information. We are not an authorized dealer of this product and any warranty included with the product may not be honored by the manufacturer. dell optiplex 755 cpu with fan. Condition is Used. Shipped with USPS Retail Ground.